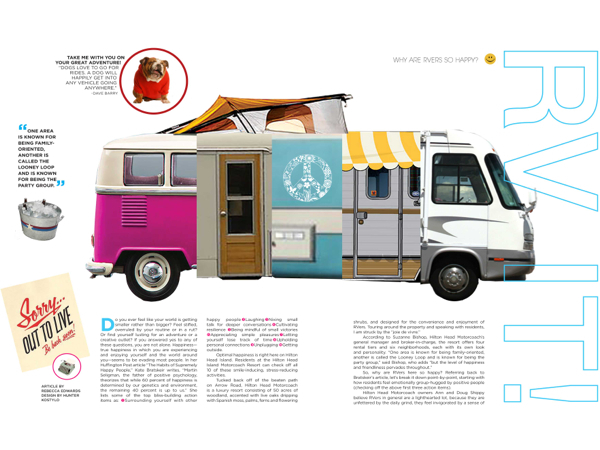 Hilton Head Magazines: CH2/CB2: RV It!- Why are RVers So Happy? Do you ever feel like your world is getting smaller rather than bigger? Feel stifled, overruled by your routine or in a rut? Or find yourself lusting for an adventure or a creative outlet? If you answered yes to any of these questions, you are not alone. Happiness—true happiness in which you are experiencing and enjoying yourself and the world around you—seems to be evading most people. In her Huffington Post article “The Habits of Supremely Happy People,” Kate Bratskeir writes, “Martin Seligman, the father of positive psychology, theorizes that while 60 percent of happiness is determined by our genetics and environment, the remaining 40 percent is up to us.” She lists some of the top bliss-building action items as: Surrounding yourself with other happy peopleLaughingNixing small talk for deeper conversationsCultivating resilience Being mindful of small victories Appreciating simple pleasuresLetting yourself lose track of timeUpholding personal connections Unplugging Getting outside. Optimal happiness is right here on Hilton Head Island. Residents at the Hilton Head Island Motorcoach Resort can check off all 10 of these smile-inducing, stress-reducing activities. So, why are RVers here so happy? Referring back to Bratskeir’s article, let’s break it down point-by-point, starting with how residents feel emotionally group-hugged by positive people (checking off the above first three action items). Hilton Head Motorcoach owners Ann and Doug Shippy believe RVers in general are a lighthearted lot, because they are unfettered by the daily grind, they feel invigorated by a sense of exploration and they are more open-minded and openhearted from seeing more of the country. “These are some of the best friends we’ve ever made!” they exclaimed. So what about being quick to recover and celebrating personal wins (action items 4-5)? “RVers are creative, flexible, inventive people,” Claudia Hall said. “For example, the electronic shade in the windshield does not go up because the roller motor needs tweaking, but there is no one immediately around who can fix it. The answer? Duct tape! Or a seal might leak and you need a temporary fix—that’s right, duct tape!” She jokes that everyone at HH Motorcoach is a mechanic, flooring specialist, window treatment specialist, cleaning specialist, etc. because they have to be, and furthermore they gain satisfaction doing it themselves. As for being grateful for the little things in life (action item 6), you should check out the Hall’s motorcoach. Inside, cozy area rugs make bare feet happy, two dogs are curled up by the electric fireplace, and a leather sofa says “ahhh” as you sit down just about the same time you do. Outside this comfy coach, the resort’s natural environment summons you to stop and smell the Lowcountry flowers. “At HH Motorcoach Resort, the environment is truly an untouched beauty of gorgeous landscaping,” Claudia Hall said. “The beautiful backdrop here puts everyone on an equal playing field, so it doesn’t matter what type or size coach you have, or your personal background; people here are appreciating their surroundings,” Bishop added. But just because they are on the move, it doesn’t mean RVers are disconnected from their family and friends (addressing 8-10). “RVers of any age are at the forefront of new technology,” Claudia Hall said. “This is a group of people who are heavily e-enabled. Mail is set up to go where they go, bills are paid electronically; with state-of-the-art motorcoach systems and satellite dishes, work can be done from anywhere. Wi-Fi and Skype offer interaction with anyone any time.” But know that being on the open road influences RVers to prioritize when to plug-in. Rather than the mindless Facebook click-by or web search, they take in the scenery and then connect in a more thoughtful way. “We are probably closer to business, friends and family than any other collective group,” Hall added. There is a difference between a camper and motorcoacher. We’ll begin with the different classes: “A”, “B”, and “C”. (Hilton Head Motorcoach only allows “A” and “C”.) Class “A” coaches are built on heavy-duty frames that use similar construction to the big 18-wheelers you see on the highways. Class “A” RVs are known for their luxury and quality, are very roomy, and sleep two to four people comfortably. Class “C” RVs are medium-sized and supported by a cabin chassis. They are usually recognized quickly by their over-cab sleeping area. And Class “B” RVs look very much like a van and are often referred to as conversions vans or camper vans. Classes “A” and “C” don’t camp; they travel—usually in style. “Another big misconception about RVers is that we are all old and do nothing but play bingo and shuffleboard. But, the demographic has changed, and many families now own RVs,” Ann Shippy said. 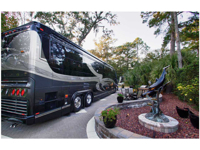 Hilton Head Motorcoach residents enjoy a full-amenities clubhouse, complete with a heated pool, tennis courts, snack bar, ballroom/conference hall, meeting room and kitchen. Plus, Hilton Head Motorcoach is very interested in integrating more into the community. “We host a few international tennis tournaments and we are always looking for ways to promote Hilton Head and partner with other area businesses,” Bishop said. Basement: The storage area below the floor of the RV, accessible from the outside. Basement storage usually refers to storage in a Class “A” or Class “C” motorcoach. Boon Docking: Also known as dry camping, boon docking refers to camping without any hook-ups, namely camping without hooking up to any electric, sewer or water facilities. You can still have electric from your RV batteries and water from your freshwater holding tank. Coupler: The part of the trailer that attaches to the ball of the hitch. Dinette: Booth-like dining area. Table usually drops to convert unit into a bed at night. Dinghy or Toad: The term for a vehicle that you are towing with your motor home. Fiver: Another name for a fifth-wheel RV. FMCA: Family Motor Coach Association. Holding Tanks: There are three different holding tanks on most RVs: fresh water, gray water and black water. The fresh water tanks hold the water you will use for water you will pump into your RV when you are not getting water from an outside source. The gray water tank holds water from your kitchen and shower. The black water tank holds the water and waste from your toilet. Motorcoach: A motorhome that is built on a bus-type chassis. Pop-Out: The term for a room in an RV that pops out for additional living space. Porpoising: A term used to define the up and down motion in an RV while traveling. Reefer: A slang term for the refrigerator in your RV. RVDA: Recreational Vehicle Dealers Association. RVIA: Recreational Vehicle Industry Association. RVRA: Recreational Vehicle Rental Association. Slide-Out: Room or area in your RV that slides out to make additional space for living. Underbelly: The RV’s under floor surface, which is protected by a weatherproofed material. Q. Who owns the Resort? A. Each of the 401 individual sites is privately owned with fee simple title just as home sites are normally owned in a community. The common elements, i.e., streets, recreational buildings, tennis courts, swimming pool and other improvements are owned in common by the site owners and make up the Hilton Head Motorcoach property owners association. The resort was developed by Outdoor Resorts of America (ORA), which is the premier luxury motorcoach developer in the U.S. and Canada, headquartered in Bermuda Dunes, Calif. In December 2002, the Hilton Head Motorcoach property owners association purchased the rental and sales office from the developer. Q. How is the Motorcoach Resort governed and managed? A. The property owners association is operated as a homeowners association, managed by the resort manager, and the governing body is the board of directors, elected by the membership of the association. The rental and sales office is a limited liability corporation owned by all 401 owners. This business is managed by the resort manager and the governing body is the board of directors, elected by the membership of the association.